The CanX-6 (Canadian Advanced Nanospace eXperiments), a.k.a. 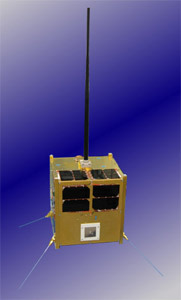 NTS (Nanosat tracking Ships), project was started in October 2007 as a collaboration between COM DEV International Ltd. and UTIAS/SFL to develop a 6.5 kg nanosatellite that will serve to demonstrate key elements of COM DEV space-based AIS (Automatic Identification System) detection technology and enable any design changes to be incorporated prior to launching full operational systems. Hence the spacecraft is also known as NTS - the Nanosatellite Tracking Ships. The bus for CanX-6 is provided by UTIAS/SFL. It is a combination of CanX-2-class electronics mounted the 200 × 200 × 200 mm structure developed for the Generic Nanosatellite Bus used by the CanX-3 (BRITE) and CanX-4 & CanX-5 missions. The payload and antenna were developed by COM DEV, and spacecraft integration took place at UTIAS/SFL. CanX-6 will be deployed by the Space Flight Lab's XPOD GNB separation system. This class of mission shows how nanosatellites are well suited for responsive space applications as the development process was only seven months. CanX-6 has now been shipped to India in its XPOD GNB for final integration with the launch vehicle. The launch schedule remains on track with an expected launch date of late April. CanX-6 will have a nominal mission life of six-months. The CanX-6 satellite features limited AIS data storage capacity (90 seconds of sampled baseband data, both AIS channels) and has limited AIS data downlink capacity (32 kbps). From an altitude of 630 km it has a field of view of 5200 km diameter.